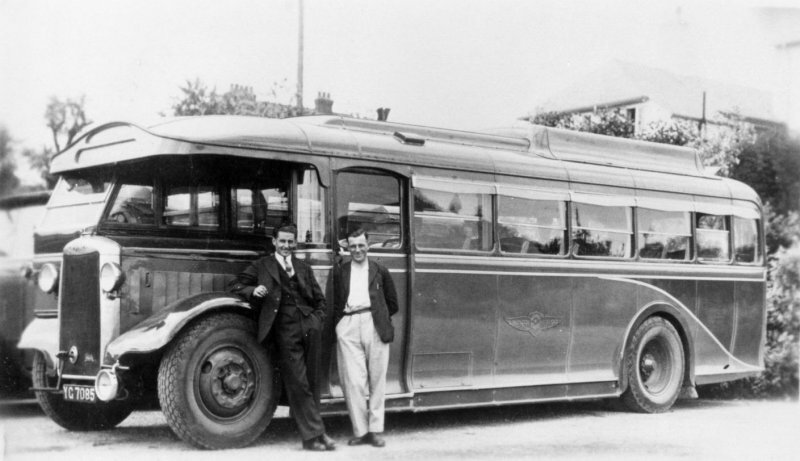 From humble beginnings on 29th October 1929 - when a 22 year old bus driver called Reg Toop decided to leave his employer George Vacher and set up in business on his own in competition against him with a Ford Model T 14-seater - this organisation grew to be the largest independent operator in the county of Dorset in post-war years. Whether by coincidence or as consequence, Vacher sold his business to the expanding Hants & Dorset Motor Services in August 1930, and remained in their employ as the local inspector for many years afterwards. He died in 1958 at the age of 71. Vacher had originally traded as Bere Regis Motor Services - the name that Toop then acquired almost by default when it became available, changing it to Bere Regis & District, having previously traded as Pioneer. 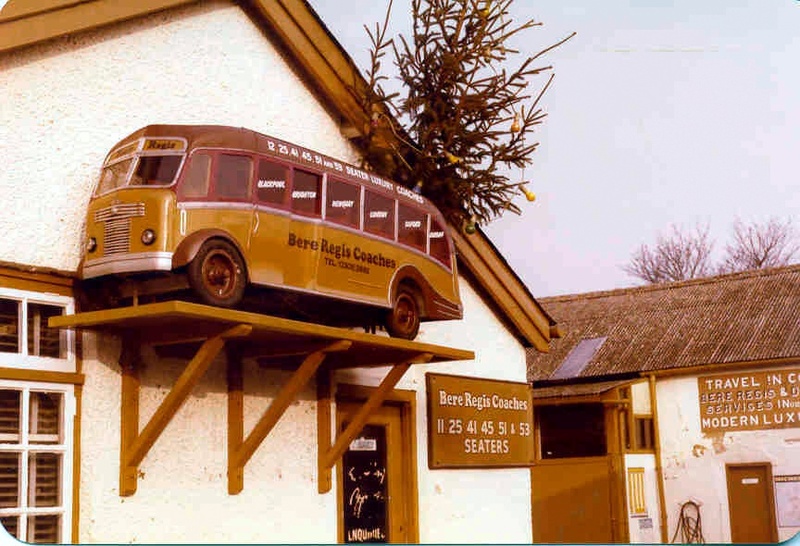 Vacher had operated from his home village of Bere Regis since horse drawn days and acquired his first motor bus in 1919. This was used on routes to Dorchester on Wednesdays and Saturdays and to Poole on Mondays and Thursdays. By 1927 there were two motor vehicles and additional routes were being run to Blandford, Bournemouth, Wimborne and Wareham. With regards to the latter destination, Harry Farr was running a motor bus to Wareham from Bere Regis on Thursdays and Saturdays too, since at least 1920. A picture of George Vacher's Bere Regis Motor Service from the late 1920's. The charabanc was carrying 27 people, plus the driver. 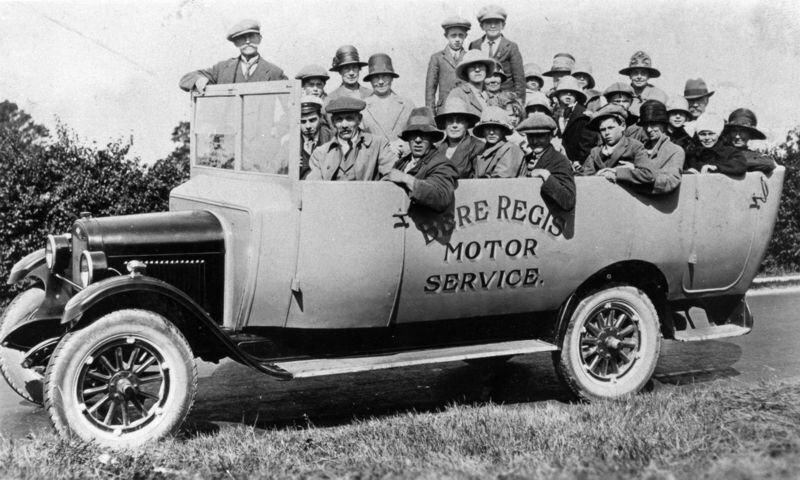 The driver, in the peaked cap is Reg Toop, who in 1929 went on to establish Bere Regis Motor Services, which rapidly built into a large enterprise across Dorset. · Bere Regis – Kingston - Lytchett Matravers – Wareham (presumed Thursday for market but discontinued by 1933). Hants & Dorset had considered purchasing the Davis business, but the purchase did not proceed because the revenue on the main Poole - Dorchester route was below cost and unsustainable. After the negotiations failed the frequency of the service was reduced. A picture from 1936, shortly after Mr Ironside joined with Mr Toop, beside their Wycombe-bodied Gilford 176S Hera bus YG7085 while out on a coach trip. At the left is Bill Ironside and on the right Fred Hann, the driver, who was later manager of Bere Regis in Wimborne and Ferndown for many years before becoming publican of the Rising Sun in Wimborne. Dolphin Coaches took over their later Wimborne premises in Stone Lane in 1996 and are still there (with the modern derivative of their old telephone number which was Wimborne 32). The Dolphin Coaches business was started and run by Fred Hann's nephew Terry Hann. Between them the three partners, Reg Toop, Percy (son of Israel) Davis and Bill (son of James) Ironside, expanded the fledgling enterprise - largely by acquisition of other businesses, especially during the Second World War - from pre-war market day services to an extensive post-war rural and interurban network with regular daily routes serving Dorchester, Sherborne, Yeovil, Sturminster Newton, Shaftesbury, Blandford and Poole. A photo from 1938 shows six drivers: Johnny Bowring, Fred Hann, Percy Davis, Bill Ironside, Arthur Ironside and Charlie Ironside. The firm's first wartime acquisition was the business of W J Laws in June 1940, and his route from Briantspuddle, Tolpuddle and Puddletown to Dorchester was added to the growing network. During the war smaller operators faced many difficulties; extra passengers had to be carried, a scarcity of fuel and resources, and time expired vehicles in need of replacement. 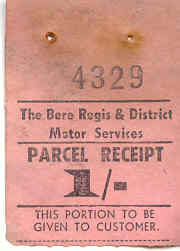 Bere Regis and District Motor Services were ever ready to buy up routes to expand their network. (A full list of operators taken over is here). 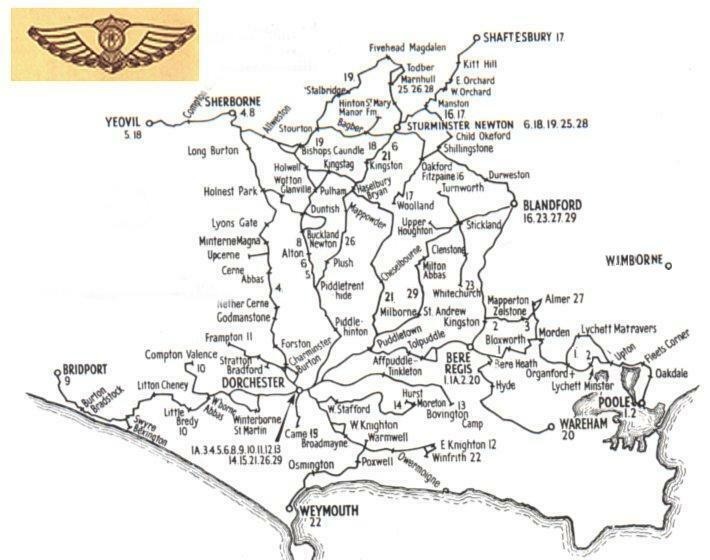 After the war the medley of radial village services was melded into a comprehensive network of interurban services across mid-Dorset. From a one vehicle operation in 1929, by 1945 the fleet size had reached 40 vehicles. So with the end of the war it was now necessary to turn attention to renewing the vehicle fleet. This started in 1946 with the delivery of ten new Bedford OB's to the business, as well as a varied mix of second hand vehicles - including two ex-Chester Leyland Titan TD4s, AFM518/519, which were the firm's very first double-deckers. 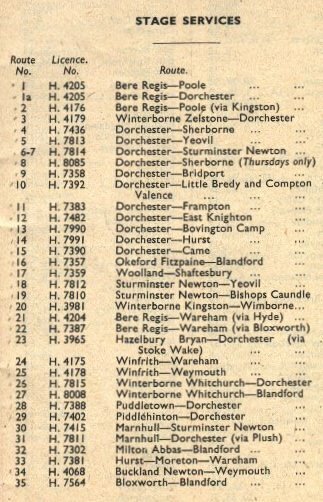 These were usually employed on the Bere Regis - Poole, Bere Regis - Dorchester and Dorchester - Sherborne routes (services 1, 1a, 2 and 4 in the 1949 list of routes reproduced below). A further Titan TD2 YG710 followed in 1948, and it is thought three ex-London STLs were acquired in 1954. 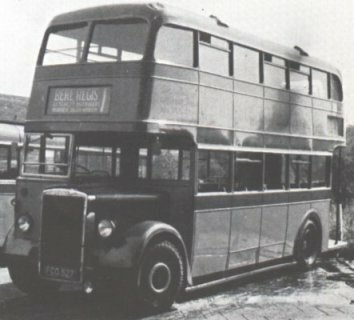 The only other double deckers operated by the company were two more modern looking low bridge 1947 Leyland PD1s that were acquired in 1949 from Hants & Sussex (FCG526/527) and were in the fleet until 1960. The vehicles were painted in a livery of mid and dark brown, from which came the 'brown bombers' nickname we used as children in Dorset. The livery came from the three partners, the dark brown from Toop, the other brown from Ironside and the red around the windows from Davis (whose own buses had been red). The halcyon years for bus operations were post-war in the late 1940s and early 1950s. At this time Ironside ran the Dorchester depot and office, with Toop at Bere Regis and Davis at Sturminster Newton. These were times of rising costs though - before the war the tax on fuel was 9d a gallon; in 1950 it was doubled to 1/6d and in 1952 it reached 2/6d a gallon. Inevitably this impacted on bus fares, although those of Bere Regis were comparatively modest when compared to Hants & Dorset and Southern National. As well as a wide range of private hire work there were also substantial numbers of school and works contracts run by the firm alongside wide-ranging forces leave express services from Portland Dockyard; Bovington, Blandford, Piddlehinton and Lulworth Camps to destinations including Birmingham, Manchester, Leeds, Doncaster and Liverpool. The abolition of national service in the early 1960s impacted on this work. As the years went by the various coaching types of operation would become progressively more and more important than the bus services. Harry Oliver stands proudly besides his double decker FCG 526. Harry worked for Bere Regis & District for many years and he drove this particular bus on the service to Poole. The conductor he worked with was a lady but we can't remember her name (was it Peggy?). 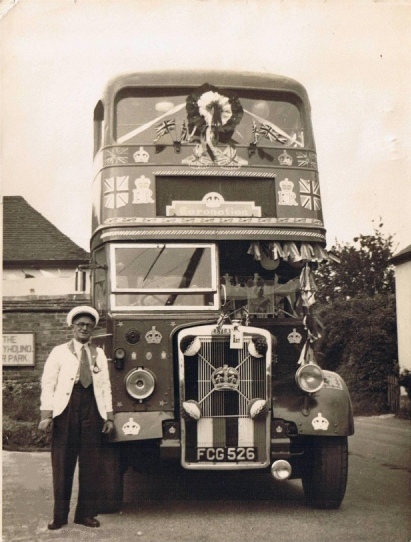 This photo was taken in the car park of the Greyhound Inn in Winterborne Kingston the year of the coronation 1953 and it is believed it was the carnival entry winning first prize. Harry also drove coaches on various school runs and lived at 83 West Street, Bere Regis. He was married to Alice Georgina Brown, a local girl. We believe Harry came originally from the village of Winterborne Kingston. 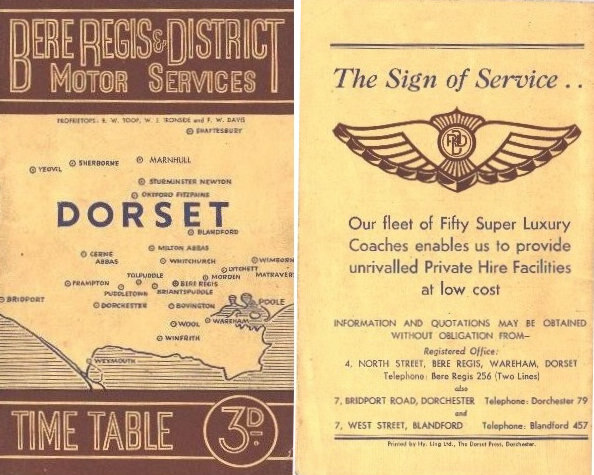 In July 1959 the daily trunk services from Bere Regis to Poole (routes 1 and 2) and Dorchester (routes 1a and 3) were sold to Hants & Dorset, who had also operated over the 1 and 2 routes for many years with their services 91 and 90 respectively (inherited from the George Vacher takeover in 1930). The Poole routes warranted double deck operation and were sufficiently busy in the 1950s that the 5.30pm from Poole on route 1 often had to be duplicated, usually by a Bedford OB coach. 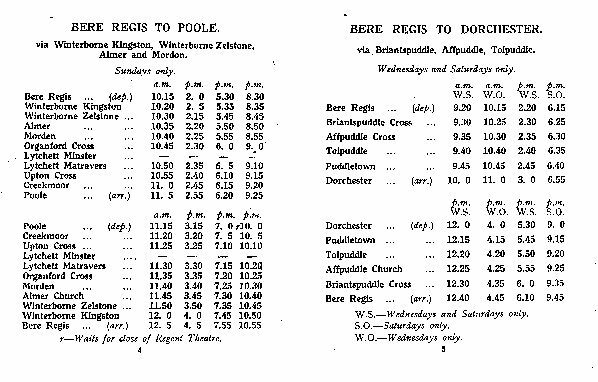 Tickets of the two companies were not interavailable and the Bere Regis fares were generally a penny cheaper. 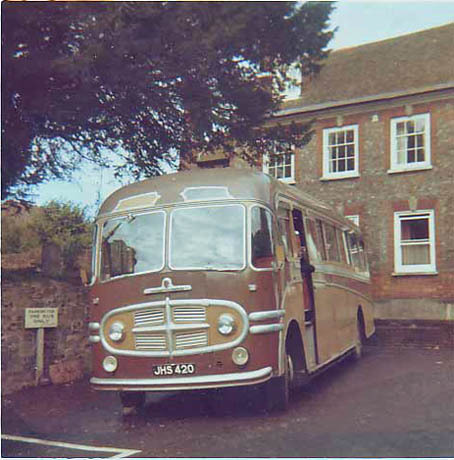 H&D had kept a bus outstationed in Bere Regis ever since 1930. Whereas Bere Regis & District had provided the majority of the timings on the route to Poole via Bloxworth (1 / 91), the opposite was true on the route via Kingston and Zelstone (2 / 90). H&D increased the frequency of their timings to compensate for the loss of the Bere Regis services, and also introduced new route 11a from Bere Regis to Dorchester to replace the old 1a and 3. By now the focus of Bere Regis operations had moved away from the village in which it had been founded, westwards towards the county town of Dorchester - a town which had always been at the centre of independent bus operation in Dorset. By 1961 the fleet size had grown to 92 vehicles including AEC Regal (plus a solitary Reliance); Bedford OB and SB (also two OWB's); Commer, Daimler, Dennis and Maudslay; and Leyland Tigers, Tiger Cubs and Royal Tigers - but still with a preponderance of second hand vehicles. 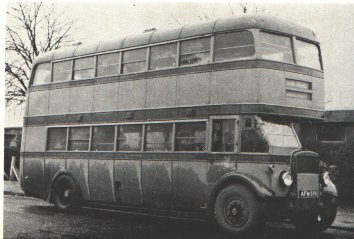 This grand total of 92 included 5 minibus 11-seaters (two Bedford CAV / Martin Walker and three Morris J2), all the other vehicles in the fleet at this time were coaches except for one solitary bus, LWR377, a 1951 36-seater Duple bodied Daimler Freeline, which had come to Bere Regis from Ledgards of Yorkshire in 1960. Twelve of the fourteen Bedford SB's had Plaxton bodies and were new to the firm in 1959 and 1960. A new central depot and workshop were established in 1964 on the Poundbury Industrial Estate in Dorchester, as successor to the original Bridport Road base in the county town (which had been acquired when Whitty's business was taken over in 1942). By 1966 there were 89 vehicles in the by now exclusively single deck fleet - of which 58 were Bedfords. Still over sixty per cent were second hand purchases and the policy at the time was to run vehicles into the ground. During the 1960s and 1970s some of the long established bus routes were withdrawn and operations handed over to other operators on the same road, eg Ironside's original service Dorchester - Winfrith - East Knighton was sold to Dorset Queen in 1965 and Dorchester - Frampton passed to Pearce in 1975. Both were incorporated into the respective existing services of the new operators. Percy Davis was the first of the three partners to die, on 19th May 1964 aged 56, and he is buried in St Andrews churchyard in Bloxworth. Next to go to the big bus garage in the sky in 1970 was the firm's Managing Partner for many years, Bill Ironside. This left the firm in the hands of the original founder Reg Toop, who as last of the three partners died in 1973. Reg was remembered by the late Mervyn House of Mid-Dorset Coaches as 'someone who would help anybody'. Following Reg's death, during the 1970s and 1980s, whilst the trading name remained Bere Regis & District, the operating licences were held in the name of 'the trustees of R W Toop deceased'. Reg's widow Ethel left the day-to-day management of the business in the capable hands of Traffic Manager Maurice Crocker (who died in 1982) and General Manager Ray Roper, both of whom had worked for the firm for many many years. Henry Frier joined the firm as Traffic Manager in 1983. 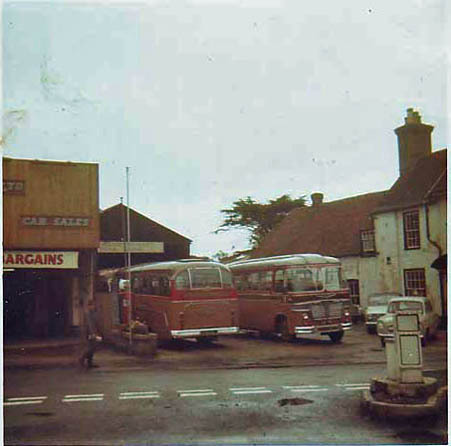 Bere Regis celebrated the 50th anniversary of the firm's founding in 1979, and the remaining core network of bus routes was to continue largely unchanged until the deregulation of buses in 1986. By then the overall fleet size was 83 vehicles, garaged at Dorchester (which had been the head office for many years), and also at Bere Regis, Blandford, Hazelbury Bryan, Sherborne, Wimborne and Weymouth. A daily express coach service from Dorset to London was started in June 1983. Private hire, contract work, holidays and tours had become more important than bus operation over the years and at the time of bus deregulation in 1986 only a few of the services were registered to run commercially without benefit of council subsidy (Bovington - Crossways - Dorchester and Duntish - Piddle Valley - Dorchester). Thus several of Bere Regis' traditional routes were lost to other operators as part of the county council's competitive tendering process. The Dorchester - Cerne Abbas - Sherborne trunk route passed to a very unlikely named operator, Air Camelot of Wincanton, whilst another important route Blandford - Sturminster Newton - Okeford Fitzpaine went to Oakfield Travel of Blandford. The depots at Sherborne and Blandford were closed at this time. The Bere Regis depot in East Street, Blandford, in October 1967. By then many bus routes were operated by coaches. (Photo Simon Brown). Bere Regis Bedford SB JHS420 laying over between runs, also in Blandford in October 1967. (Photo Simon Brown). In 1989, Bere Regis introduced a town service in Dorchester. Although based in the town, their bus operations had always been on village and interurban routes, and they had not previously operated locally within the county town. The town services had been operated initially by private operators who succumbed to Southern National in the 1930s; in the 1980s the town services were operated for several years by Interbus, an operating arm of Barrys Coaches of Weymouth, before reverting to Western National (as Southern National had by then become). Other successful Bere Regis operations at this time included considerable works contract operations for BP to and from the Wytch oilfield in Purbeck, involving up to 25 vehicles at the peak, and the daily express coach service to London started by Henry Frier in 1983. The express continued under the First Dorset Transit banner, then operation passed to Bluebird of Weymouth from November 2003, but only for a few more years. Now there is only National Express on the route. Ray Roper retired in 1993 and Henry Frier succeeded him as General Manager. 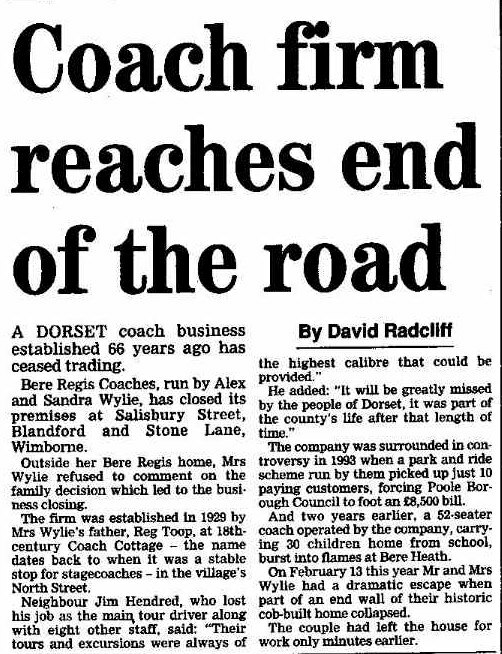 The Bere Regis firm survived as a complete entity until 1994 when most of the operations and the Dorchester base were sold to Dorchester Coachways / West Dorset Coaches - a new firm which was part of the Cawlett group who also controlled Southern National. A small nucleus of private hire vehicles remained under the Bere Regis Coaches name, operated by Reg Toop's daughter Sandra Wylie and her husband Alex. These were garaged in Wimborne and controlled from an office in Blandford. Whilst the operations disposed of in Dorchester and west Dorset prospered - and passed with the Cawlett group to the First Group in 1999, operating from the year 2000 under the trading name First Dorchester - those at Blandford did not, and regrettably the proud name of Bere Regis Coaches faded away on 30th September 1995 after 66 years traveling the highways and byways of rural Dorset. From April 2001, the headquarters of the Bere Regis firm - which had been in Dorchester for many years past, firstly at Bridport Road and then in the old barracks on The Grove trading estate - were closed. The premises in The Grove had passed to Dorchester Coachways in 1994 and then in 1999 to their successors First Dorchester. The link was finally broken on 22nd April with the closure of First Dorchester and the transfer of the vehicles and drivers to operate from First Southern National's Weymouth depot. 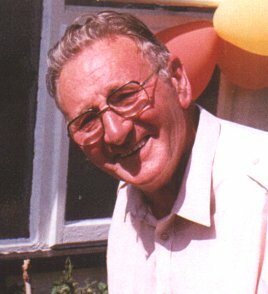 Long time Bere Regis general manager Ray Roper died in retirement in May 2001 at the age of 81. And then in January 2006 sadly we also had to record the death of Maurice Norman, one of the old Bere Regis drivers, and a great friend of the present writer for many years. In the post war years, the routes from Dorchester to Sherborne and from Bere Regis to Poole were busy enough to warrant double deck operation. Waiting at the Kingland Road terminus by the Ladies Walking Field in Poole, on route 1 to Bere Regis via Lytchett Matravers and Bloxworth, is a rather dirty Leyland Titan TD4 AFM519 with 52 seat Massey body. This was of 1936 vintage and was one half of a pair purchased in 1946 from Chester (the other was AFM518). 519 was sold in January 1957 - and ended up eventually as a chicken shed - whilst 518 was scrapped in December 1958. Another Leyland was acquired in 1948. This was a TD2, registered YG710, new to Ripponden & District in 1932, and with two other owners before coming south. It originally had a 51 seater Leyland body and was sold in December 1952 by which time Bere Regis had rebodied it as a 32 seater coach! I used to see the 1.30 pm lunchtime departure from Poole to Bere Regis on a daily basis when I attended Poole Grammar School, until the Poole routes passed to Hants and Dorset in 1959. Another regular performer was ex-Hants & Sussex FCG527, seen here at the other end of route 1, freshly washed and glistening in the sunshine in the Bere Regis depot yard. Acquired in May 1950, this was a Leyland PD1 with Northern Coachbuilders 55-seater lowbridge body, and was new to Hants & Sussex in 1947. Again one half of a pair, the other being FCG526, acquired June 1949, also from Hants & Sussex, and sold in 1960, whilst 527 was scrapped in the same year. To complete the list of BR&D deckers, there were three 1936 AEC Regents from London Transport (class STL), all with 56 seats, acquired in 1954. These were CXX289, DGX286 and BLH793, but these three may not have been operated and only bought for spares and eventually scrapped by BR&D. Thus in total Bere Regis had at one time or another eight double-deckers. The route map below shows the network of Bere Regis bus routes in 1956. Many of the routes on the map are market-day type services only running on one or two days a week. The daily routes were 1 Poole - Bere Regis, 1A Bere Regis - Dorchester, 4 Dorchester - Sherborne, 5 Dorchester - Yeovil, 6 Dorchester - Sturminster Newton, 16 Blandford - Okeford Fitzpaine, 17 Shaftesbury - Woolland and 18 Yeovil - Sturminster Newton. (NB Some of the services have been renumbered from those given in the list of routes from the 1949 timetable above, as by 1956 routes 7 20 22 24 28 29 33 34 and 35 had been withdrawn (using their 1949 numbers!)). Note also that Wimborne is no longer served (although there was still a garage there at the time). The motif illustrated was used by Bere Regis for many years. THE BEGINNING - a pre-war timetable, thought to date from 1936 and to be the first timetable issued by the newly formed partnership. Henry Frier remembers A Day at The Grove (the Bere Regis office in Dorchester in the 1980s). Colin Miller's reminiscences of a bygone age when his father was a driver for Bere Regis are here. Some further pictures of their coaches can be found here. If (unlike me) you look at Facebook then here is the Bere Regis Coaches online group. WHOTT hold an annual Bere Regis & District running day in Dorchester, usually in August.